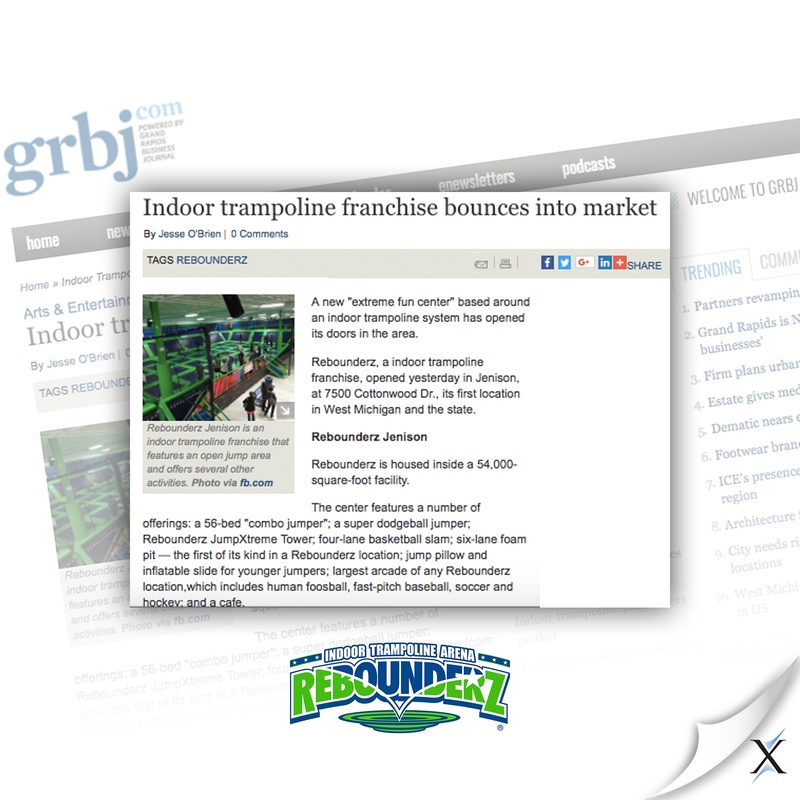 Fast-growing Rebounderz Franchise and Development, franchisors of Rebounderz Indoor Trampoline Arena, sought to increase its brand nationwide to grow its franchise units. The company wanted to share its success story with more consumers and prospective franchisees. 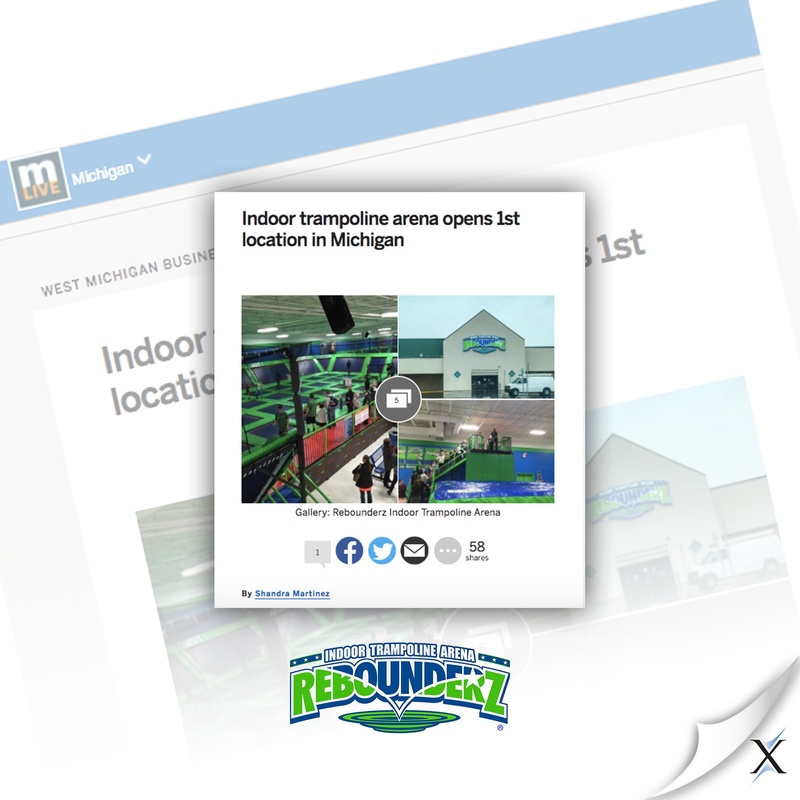 Rebounderz conducted a competitive public relations agency search and selected Axia Public Relations based on the PR firm's responsiveness, professionalism, and its award-winning PR results for franchisors and family entertainment centers. The public relations firm jumped right in, drawing from its franchise PR experience, developing a public relations plan designed to generate national coverage surrounding the franchise opportunity and brand. Axia researched several editorial calendars of business, industry, and franchise media outlets for angles and timelines to pitch. In addition to the standard business outlets and franchise publications, Axia also looked to publications focusing on indoor and outdoor parks, attractions, and family entertainment center trade industries for additional news opportunities. 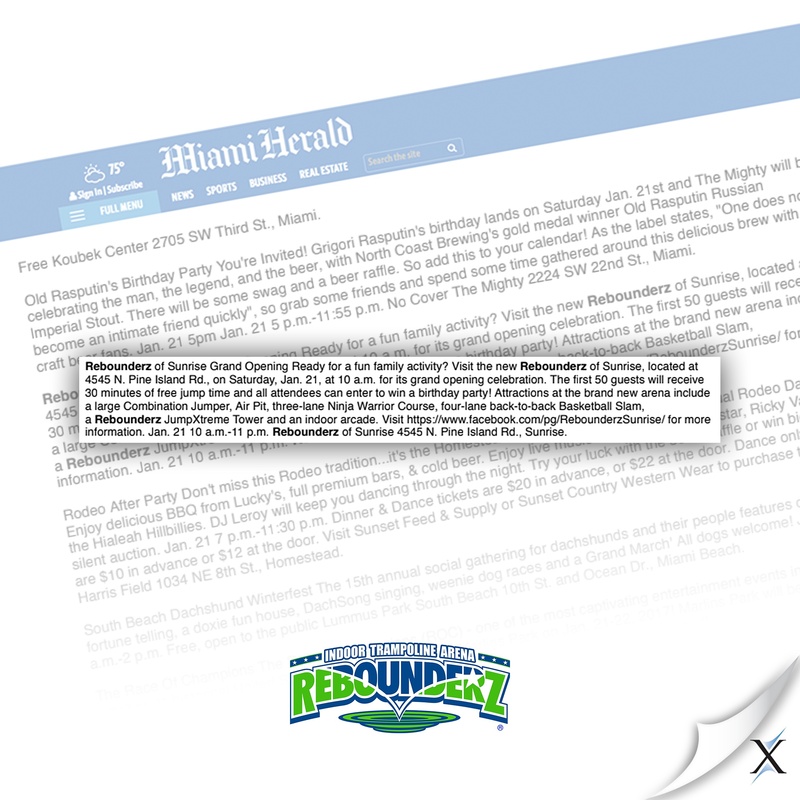 Throughout the campaign, Axia provided comprehensive public relations counsel and services to Rebounderz, including account management, crisis communication, media relations, news writing, and media pitching. Axia’s relationships with reporters at target media outlets were key to the quick launch of the PR program. In the first four months, the PR firm successfully approached contacts at business, franchise, and industry trade publications including Examiner.com, Forbes, Franchise Chatter, Franchise Times, Franchising USA, Funworld, Inc., Multi-Unit Franchisee, Park World, and Play Meter, to name a few. Axia also identified an opportunity to pitch this family-friendly activity to online and print publications under the family and parenting umbrellas. Momentum built quickly and within four months, Axia reached more than 69.9 million consumers and business people with its initial PR efforts. 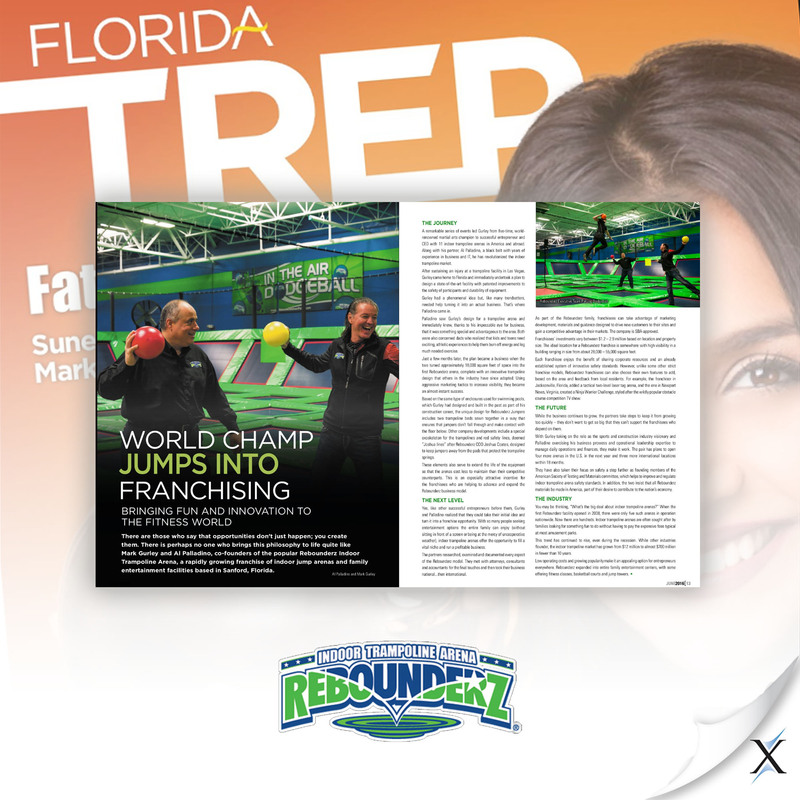 These efforts and outreach included a franchisee spotlight in Entrepreneur’s “Franchise Players” column, a Q&A with Franchise Chatter, a bylined article by Rebounderz president and co-founder Al Palladino in Franchising USA’s monthly magazine as well as pickup in more than 200 hyperlocal outlets through a NewsUSA syndication. The company’s CEO, Mark Gurley, earned mention in an article titled “How to market a franchise using social media” on Forbes’ website and in CEO Blog Nation’s roundup of CEOs for its story “What do you love about being an entrepreneur?” The Orlando Business Journal also presented Mark with a "CEOs of the Year" award. With the benefit of Axia's relationships, Mark became a contributing writer to the American City Business Journals, with his bylined articles publishing on more than 40 of the American City Business Journal websites and occasionally in print. 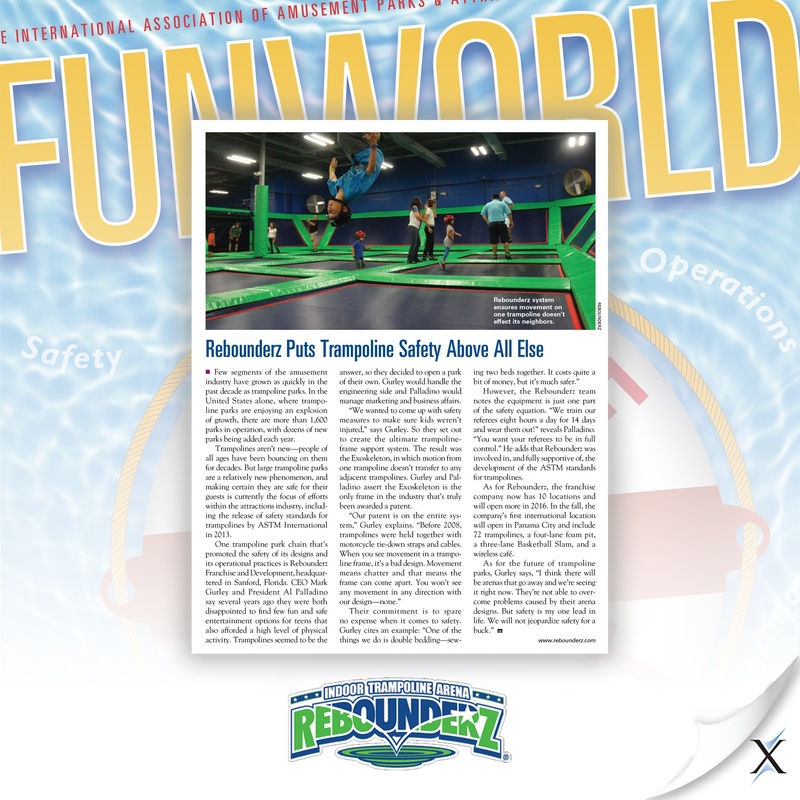 On a local level and in support of Rebounderz franchisees, Axia earned news media coverage surrounding the store openings in California, Pennsylvania, and Virginia in local newspapers and business journals. The firm also secured local coverage regarding the company’s donation of thousands of shoes to those in need in the Philippines. Within four months, Axia’s efforts led to more brand awareness among consumers and prospective franchise investors interested in the growing international franchise opportunity. Axia’s commitment to the client and to results continues to grow: The firm has secured additional media coverage in national outlets, which will appear soon. 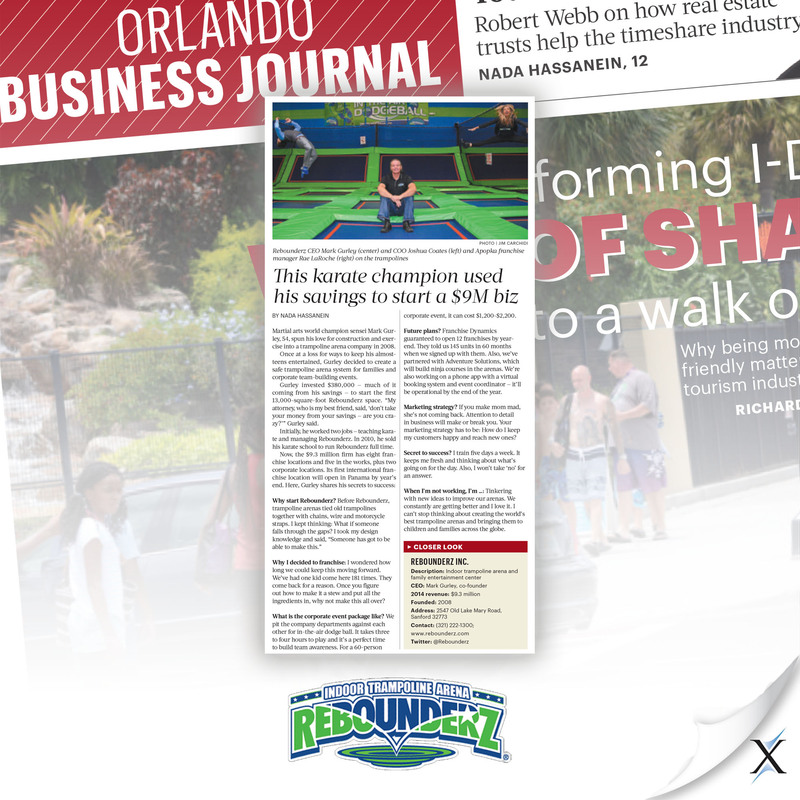 While working with Axia, in one year, Rebounderz Franchise and Development grew from $8 million to $22 million. The franchisor has gone from a $350,000 investment to a $22 million company in only three years. The company also opened its first international arena and, with Axia's PR strategy, earned several awards and recognitions, including fastest-growing company and top CEO awards. To learn how we can help your family entertainment center company and franchisor achieve similar results, contact us today at 888-PR-FIRM-8 (888-773-4768).